Gudea, the man who loved Lagash. You are looking at what Jerald Starr, an American Sumerologist and friend of All Mesopotamia, believes is the first realistic, recognizable portrait of a man in all of history. Gudea, a Sumerian king who ruled the Sumerian city-state of Lagash between 2140 and 2120 BC, has been the subject of many statues, but the statue pictured above is unique. So, you’ve now seen the man who happened to be king. Let’s get to know the man, shall we? To put it simply, Gudea of Lagash was a great, humble guy. “He was the model of piety and virtue, working tirelessly for the gods and the welfare of his people,” Starr writes in an article on his website titled, Gudea. Gudea’s reign brought with it some revolutionary social reform that even a modern eye would conclude made life easier for, and kinder to, the common man, woman and child living in ancient Sumer. He might not have written an extensive code of laws as famous as Hammurabi’s, but keep in mind that he also took the throne nearly 350 years before Hammurabi did. You’ve got yourself a pretty progressive guy here. “He was concerned about social justice, and not just the exercise of power,” Starr writes. Why was Gudea so darned nice? Gudea was a great king, because he did what great and noteworthy kings do; he built walls to successfully protect his city and its people from clear and present danger(s), he also built temples, and helped things like art and social justice thrive under his rule. That’s pretty great and nice of him, but that’s what any ruler or leader is supposed to do, if not in ancient times, then definitely in modern times. There’s nothing too fascinating about that. What’s fascinating about Gudea was that he went against the grain of typical royalty, even when he didn’t need to. Royalty wasn’t really concerned with the common people back then, and there was no one who could make them, and yet Gudea made social reforms that benefited people who’d never even been given a thought by royalty before. Consider that up until he took the throne, Gudea lived in a time and place where kings were not only anointed by the gods, but were also granted divine status themselves. We need only look at Gilgamesh–he was a great Sumerian god king, and an epic was written about him that seems as much myth as it is a testament to the status a king holds in the eyes of his subjects, for better or worse. Now, add to this that Gudea was not of royal blood. In fact, very little is known about his origins, save for having been fortunate enough to marry the right woman at the right time. Her name was Ninalla, and she was royalty, the daughter of King Ur-Bau (Ur-Baba). Lack of an attached dumu (son of) to his signature further obscures Gudea’s origins. “This would suggest that his father was only a minor nobleman and not a ranking member of the high nobility,” Starr says. So, here we have this non-royal marrying into royalty, and suddenly he is in the king pool, and there’s absolutely no resistance to his ascension to the throne. I mean, come on, not only did Ur-Bau let his daughter marry this non-royal man, but he let that non-royal man ascend the throne without hiring a hit man to stop that from happening. That’s pretty amazing. Another amazing thing that accompanied Gudea’s ascent to the throne of Lagash is that he was now king and he could be a god king, just like all the Sumerian kings who came before him, because that was pretty much part of the package at this point: become king and get one divine status free! But he didn’t use that card. 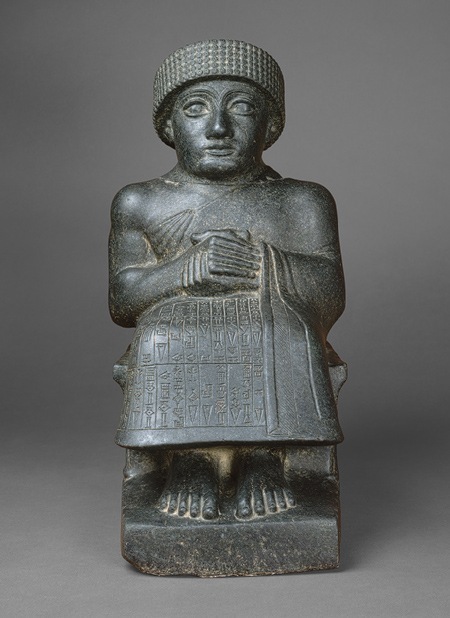 Gudea’s humility also extends to him choosing to only refer to himself in inscriptions as ensi, ruler, rather than lugal, king. Gudea also worked hard to keep things peaceful and he did a good job, despite ruling during a difficult and dangerous time for Sumerian city-states. Akkadian rule had just been weakened by tribesmen from the north, known as Gutians. 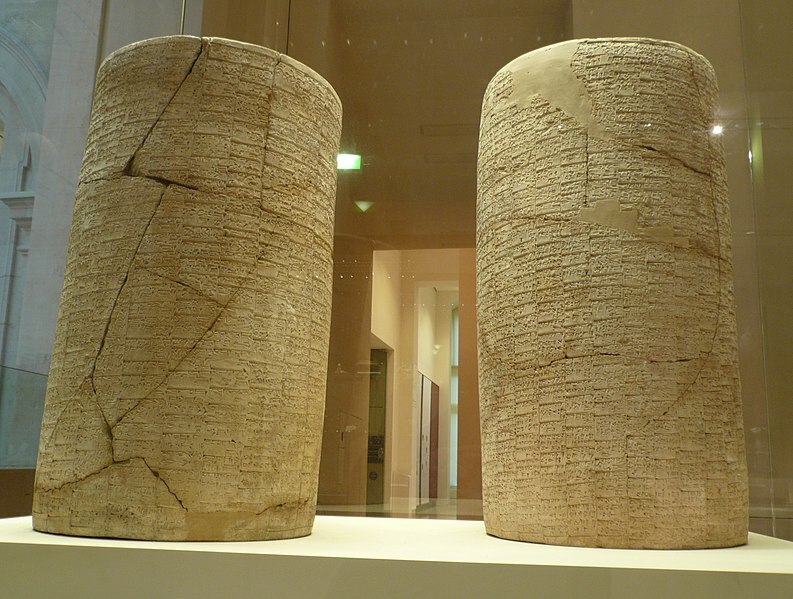 The Gutians constantly raided Sumerian city-states, but Gudea mostly only built walls and repaired them when needed for protection, appearing rather pacifist. 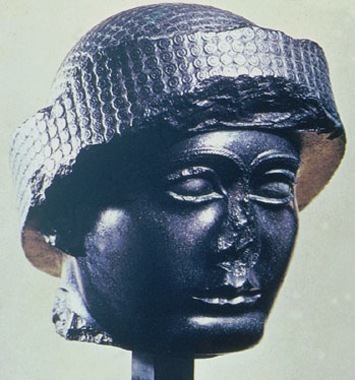 Unlike Gudea’s origins, his reign was very well-documented, and we know that he led only one major military campaign. Even the goods brought to Lagash from faraway lands were not the spoils of war, but rather those of commerce and trade, handed to him out of brotherly love, even from what are otherwise enemy lands. Another seemingly curious thing about Gudea’s wish and determination to be known as a peaceful ruler was his dedication to serving Ningirsu, the Sumerian god of war and the main god of Lagash. One of Gudea’s most notable accomplishments, in fact, was that he rebuilt a temple dedicated to Ningirsu, among others. Gudea was nothing if not religious, so that was one reason for his devotion. But of what made the strategist part of Gudea build the temple of Ningirsu, Starr says Gudea was also a “tough-minded realist”, who knew where Lagash was on the map in relation to the Gutians, and that the city-state was not strong or big enough yet to fight them. He also knew he needed to build more than just a tough army. So, temple rebuilding served two purposes, one pious, one strategic. The rebuilding of the Ningirsu temple eventually helped Lagash and Sumer regain strength and power, because it renewed a feeling of nationalism for Sumerians that proved quite beneficial. It was a brilliant strategy that worked from inside out, and brought with it a fresh new attitude of reclaimed pride and nationalism, and an eventual Neo-Sumerian Revival that united and strengthened all the Sumerian city-states that eventually beat the Gutians and gained complete independence from the Akkadians. The way I see the alabaster statue is that it is of a man who loved his city and his people. He never took what Lagash and its people gave him of good fortune and admiration and support for granted. He wanted future generations to know what he, a non-royal, common man, looked like, and he took the time to perhaps sit for the portrait himself like Starr suggests, so that they would know that anyone can benefit from the greatness of Lagash and Sumer. Gudea of Lagash became a great man whose greatness will always be known.